An amp-based dirt box capable of monster gains, saturated leads and sweet blues tones. 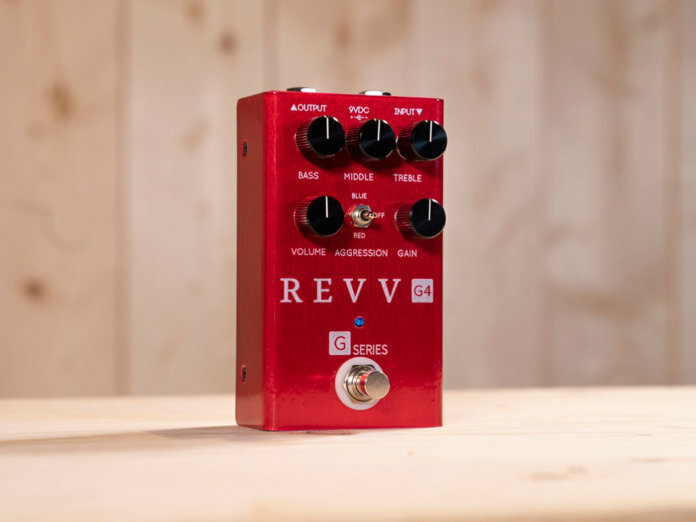 Revv has announced the G4 pedal, an amp-in-a-box unit that serves up a wide variety of drive sounds. This unit is the stompbox-sized version of the red channel 4 featured on Revv’s acclaimed Generator 120 MKII amplifier. It’s voiced for a sledgehammer-like drive that stands in stark contrast to the G3’s gain characteristics. As far as drive options go, the G4 is equipped with three voices: red, blue and off. The red option unleashes a saturated, thick gain that’s great for fat leads and chunky rhythms. Toggling the blue option, on the other hand, tightens your tone as extra frequencies are pulled back. Lastly, the “off” setting produces classic drive tones and a dynamic blues breakup. You can further sculpt these gain sounds via a three-band EQ, a master volume knob, and a gain knob. Rounding out its features is a perfectly dialled-in sag, which primes the G4 for a range of genres, including modern metal, classic rock and blues. Pre-orders at $229. More information at revvamplification.com.